Brands and manufacturers are losing control online. Ecommerce is the fastest growing channel in retail. But marketplaces are calling the shots and violating MAP. Unauthorized sellers aren't listing and pricing products properly. Etail’s ecommerce platform was built to solve the problems selling direct creates. Control your products and pricing across all channels. Keep up with constantly changing customer expectations and marketplace requirements. Tap into the $453 billion online retail market. Know how much inventory you have and where it is at all times. Automatically update for-sale inventory across all channels. Control your products and pricing across all channels. Ship orders up to six ways and always for the lowest delivered cost. Raise or lower prices when costs rise or fall. Protect MAP and spot violations. Price and reprice based on channel-specific strategies. Inventory management is one of the biggest hurdles preventing brands from selling direct. Updating available quantities across all channels as inventory levels rise or fall is often too difficult. The cost of not managing inventory properly is high - overstocks, stockouts and account suspension. Etail lets brands keep their inventory under control so they can safely sell everywhere customers buy. See on-hand and in transit inventory at any location – warehouses, FBA and 3PLs. Sell products in different quantities and combinations with Etail's unique master SKU feature. Control inventory on each sales channel. Automatically delist when inventory sells out, relist when inventory gets replenished. Avoid stockouts, cancelled orders and potential marketplace penalties. Etail's ecommerce brand management platform automates complex processes like drop shipping, cross docking, assemblies and kitting and vendor reconciliation. Predict future demand by aggregating SKUs across channels and analyzing sales history. View purchasing recommendations based on sales history, seasonality and customer demand profiles - all from one ecommerce brand management platform. If you're not in control of your pricing, you’re not in control of your brand. Pricing is a major component of your brand image and good ecommerce brand management. Etail's exclusive cost-based repricer lets you protect MAP and your margins. Automatically meet price parity requirements across all marketplaces. Automatically raise or lower prices for any number of SKUs, across any number of channels or listings, when costs and competitors’ prices go up or down. Always be selling at the right price no matter who you buy from, where you sell or how you ship. Use channel-specific strategies, not faulty algorithms. Reprice based on product type, competitor type, Buy Box ownership, inventory age and more. Protect MAP and spot violations and unauthorized sellers with Etail's ecommerce brand management platform. Protect your margins no matter how you fulfill orders - drop ship, cross-dock, pick pack ship, FBA or 3PL. Only Etail's ecommerce brand management platform factors each fulfillment method's unique cost into each repricing decision. Comply with marketplace price parity requirements across all sales channels as prices change. Your brand image is your most important asset. Etail provides the tools you need to protect it. Ensure your brand's products are listed and priced properly. Automatically update listings when costs, inventory levels or product data changes. Centrally manage listing content. Publish channel-specific product data. Sell products in different quantities and combinations across all channels while maintaining inventory accuracy. Automatically leverage multiple fulfillment methods and locations to meet customer and marketplace service level expectations with Etail's ecommerce brand management platform. Automatically remove listings for products restricted by marketplaces or containing ingredients that are banned. Prevent creation of new listings for banned products. Gain real-time visibility to all listings for your products on the marketplace. Spot unauthorized sellers, MAP violations and inaccurate listings. Online success isn’t just about sales. It’s also about margin - what's left after you buy and fulfill an order. The most efficient and profitable brand wins. It's complex work, especially across multiple channels. Real-time responsiveness is a must. There are thousands of decisions to be made - order routing, purchasing, shipping, pricing and repricing - every day. Only Etail connects your sources of inventory to sources of demand and automates everything in between. This makes reducing your operating costs not only possible, but easy. Reduce shipping costs by automatically routing orders to the location or fulfillment center closest to the end customer. Factor all of your changing costs into each repricing decision so you can win the Buy Box and protect your margins. Implement pricing strategies that help prevent channel conflict with Etail's ecommerce brand management platform. Manage all of your order, inventory and pricing data from one place with Etail's ecommerce brand management platform. Avoid transferring, reconciling, and consolidating data from different sources. Eliminate errors caused by re-entering data and by using software applications that can't communicate. Automate repetitive manual tasks to eliminate costly errors and reduce overhead costs. "Etail has been a great partner. They are flexible enough to meet the needs and changes of a rapidly growing company while delivering first class functionality." How one 3PL is helping more than 700 brands and 1,000 suppliers grow online sales with marketplace integrations, listing management, and more with ecommerce brand management. Ecommerce is evolving. Is your e-channel strategy keeping pace? 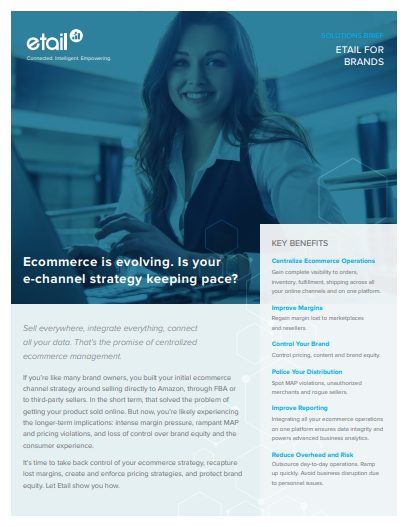 Find out how to centralize ecommerce operations, improve margins, and control your brand.